If there was one thing I took away from my long-ago, first time visit to the Wolf & Bears cart, it was the memory of their soft, seemingly homemade pita bread wrapped around the fresh ingredients of a Sabich. 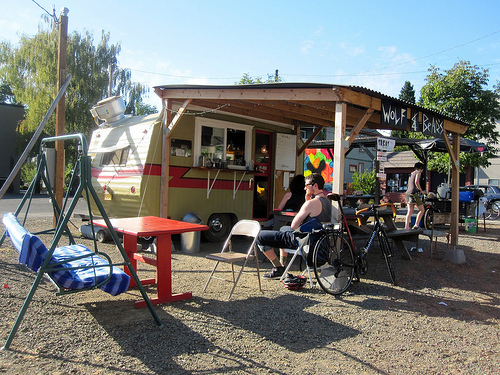 Fast forward a year, the hip Israeli style food cart is no longer all alone at the open corner lot at the top of SE 20th and Morrison, it’s now joined by the open-style Treat vegan taco stand, a couple additional tables, and a slow stream of regular visitors. Their Sabich ($6.50) is an Iraqi Jewish style pita wrap, traditionally served for breakfast, filled with creamy hummus, sliced onions, fresh greens, parsley, pickles, and grilled eggplant slices. It’s made vegan with the substitution (thankfully, no charge) of tender, roasted potatoes circles for the hard-boiled egg. Don’t even consider doubting the potato’s place over this egg, because I didn’t feel like I was missing anything. There was certainly no hope of tofu scramble in my head. The Falafel ($6.50) is a similar enfolding of the enjoyable pita bread, the housemade hummus, sweet strips of caramelized onions, juicy, grilled eggplant, fresh greens, thick falafel circles, some more fresh parsley, and tahini sauce. 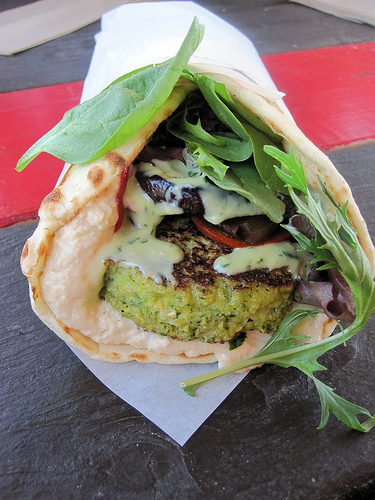 The tahini is light and tangy, and the falafel here is unlike most others in town. The patties almost tastes like they’re baked, though I’ve heard they’re actually pan-fried; soft yet firm, browned widthwise, and full of real flavors, opposed to the over-fried and/or crumbly balls seen all too frequently elsewhere. It’s not at all greasy, either. Now, if this wasn’t so darn good, I would be complaining about how this falafel, let alone from a cart – which is an outdated complaint anyhow, costs over $5. 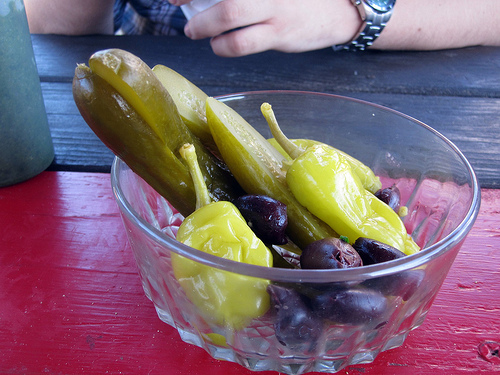 Instead, I’ll mention that wraps are served with a small side of excellent and crisp pepperocini peppers, kalamata olives, and great homemade pickles. Well worth my $6.50. Wolf & Bears is open for lunch and dinner orders from Wednesday-Saturday, and you can check out their full menu, most of which, despite frequently mentioning dairy cheeses, is actually veganizable, on their curious Myspace page. The small, appealing menu also includes salads, wraps, a tiny selection of baked goods (often vegan), daily vegan soups, cups of refreshing homemade lemonade, iced tea, Extracto coffee, and local kombucha. 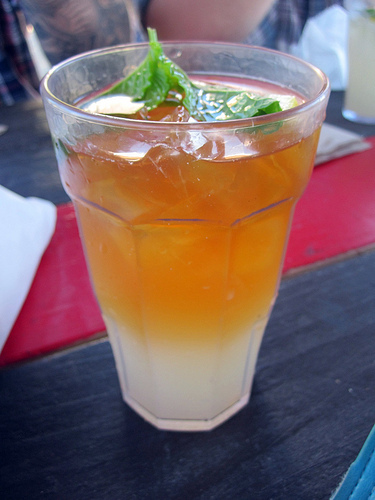 A recent small cup ($2) of combined iced tea and lemonade, adorned with fresh mint, just made me want to spend the rest of the warm day on the swing seat in their laid back cart lot, slowly sippin’. Additionally, there is a canopied picnic table in front of the cart, and if there’s not enough room, it’s a very short walk to Colonel Summers Park. I’m sold! This sounds amazing.